SORRY! Item Sold Out and Discontinued. Please consider our professional meters on the other pages. Thanks! 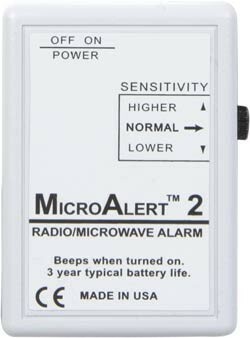 The MicroAlert 2 is a receiver that beeps when it detects emission from smart meters, cell phones and towers, microwave ovens, wireless devices, automatic door openers, etc. Designed with very low power consumption, it can stay on continuously for years using a single replaceable battery. The sources of radio emissions can be unexpected and surprising. By placing the MicroAlert 2 in your pocket, these sources are reveled, along with their strength (in microwatts/square cm). It is ideal for anyone trying to find out exactly what's emitting radio or microwaves -- microwave ovens, cell phones, radio towers and transmitters, including hidden sources. Just turn it on, select the sensitivity level you want, and put it in your purse or pocket. [Actual size is 2.25 inches high X 1.6 wide X .75 thick.] It will alert you when entering an EMF/RF field sufficient to trigger the threshold at which you have set it. A clear, loud beep indicates radio waves stronger than the level you select. If you move closer to the radio source, the beep becomes more frequent, and will ultimately become a solid tone if you move closer still, allowing you to locate where the RF/microwave is coming from. Minimum sensitivity is .001 milliwatt per cm2, making it much more sensitive than the radio/microwave section of the TriField(r) Meter (although the MicroAlert has no analog meter dial to give precise measurements, only an audible tone for indications). At the highest sensitivity, it will detect a typical cellular phone tower within 300 feet line-of-site, a typical analog cell phone 40 feet away, a digital phone 20 feet away, and a microwave oven (in use) 10-50 feet away. However, you will usually use a less sensitive setting. It's most sensitive from 100 MHz - 3 GHz.